your site received (43) points qualifying it for the DRH Design Honor for 2004. Congratulations, your site received (43) points qualifying it for the DRH Design Honor for 2004. 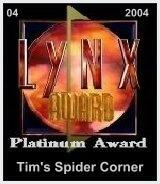 Your site has been chosen as a Platinum Award Winner of The Lynx Award for this month. I truly enjoyed visiting your site. It is evident that you have put a lot of hard work into your site. It is an honour to present the Lynx Award to you. If You Received This E–Mail It Means That I Just Came Back From Visiting Your Site, I truly enjoyed my visit to your lovely page, please accept my Silver Award for your site. Tim Congratulations, out of a field of 35 nominees your site has won our Inspirational Award for December 2003. "The Crystal Sea Inspirational Award"". The Top Site Award is a special award given by SpeedyAdverts to outstanding web sites, which excel in design or content, or show to have some special characteristics, which makes a web site different and unique. Your web site is one of them. Congratulations! I really enjoyed my time on your site as it took me on a fabulous journey into the bird spiders traits and qualities. I cannot say I would raise them myself, but you have the skill and nerve more than most. The pictures were superb and nicely optimized. Navigation well done and load time for a site utilizing flash excellent. You site is a great bookmark for those with your interest and I look forward to visiting your site again in the future. Tim's Spider Corner is a very unique with its new design. The Evaluators loved it! We know you put a lot of time and your heart into this site and it shows. Thank you for being such a great web master. Thank you very much for submitting your site for the BigOscar's Award. We have reviewed your site Tim's Spider corner in accordance with the criteria for this program. Your site scored the following: 26 Points (Bronze 24-26) You win the "BigOscar Bronze 2003 (2 Stars)", congratulations !!!! Thank You for applying for my awards. I have enjoyed my visit at your site. After reviewing your site, I am pleased to present you with "Silver" Award. Keep up the great work on your page. I'm happy to inform you, your site has won my award. Tis is a very high achievement, as my awards are not easy to win. I thank you for the opportunity, and congratulations. You have an incredible informational site on spiders. The layout and design were just as outstanding as the contents it holds! I was impressed with the ease of navigation you provide to your visitors. Your awards program shows your continued intent to give back to the web community and is to be commended. Thank you for application from Unsers Awardprogram. Your Website has been evaluated and you win the Unsers Bronze Award. Congratulation. We have completed our review of your Tim's Spider Corner site and are pleased to present you with our TOTW Treasured Web Awards Bronze Award which we have attached. Out of 106 applications received for the month of March, we only awarded four sites. Congratulations on being one of the four. Your site provides the Internet community with a wonderful educational experience. I never knew there was so much to learn about spiders. Your site is also well-designed with a good navigational system, well-researched site content, and it provides a family-friendly learning experience ! Your awards program looks great, as well, and I compliment you on building an ethical AP ! After carefully reviewing your site I feel that your site met our standards for JerryD's Bronze Award. You have worked very hard on your site and it shows! You have a nice site with great graphics and we are pleased to award your site.